August 7th saw a large turnout of participants attend the Brubaker Families of America annual reunion. More than 75 people were in attendance, with visitors from a variety of locales, including Delaware, Maryland, Michigan, Pennsylvania, South Carolina, and Virginia. 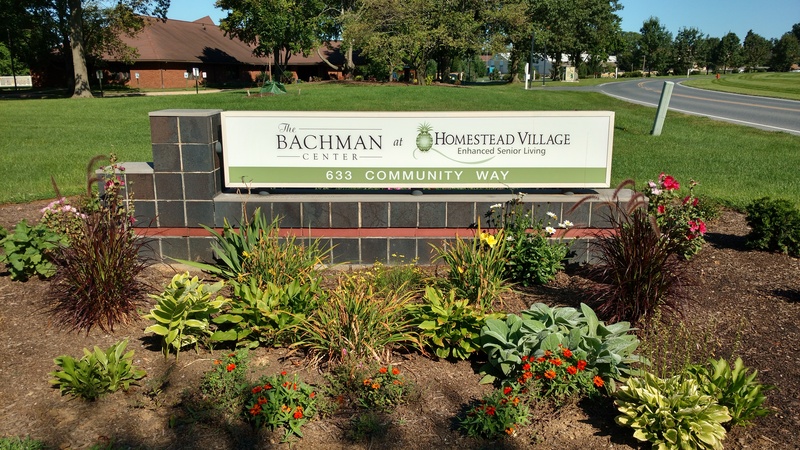 Held annually on the land of the original property patented and warranted from William Penn to Hans Brubaker, this year’s reunion was for the third time held specifically at the former Parish Resource Center, now known as Bachman Hall, on the campus of Homestead Village. On display were tables with various Brubacher-Brubaker family trees, memorabilia, merchandise, photos, and such; including an online station showing both the Family Association website and Facebook page. Celebrating Clifton Brubaker’s 100th birthday. 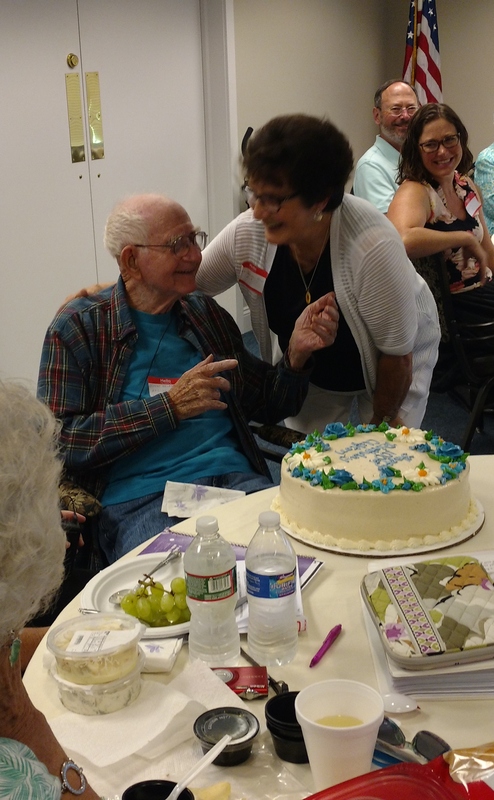 We had a special celebration for cousin Clifton Brubaker of the ‘H’ line, who turned 100 years old earlier this year. Also on display was a hand carved and assembled replica of his grandfather’s mule team and Conestoga wagon by 94 year old Bob Noll of the ‘A’ line of our extended family. Speaker Don Brubaker with the latched hook rug of the Family Crest which he made over 40 years ago. Our featured speaker this year was Donald R. Brubaker of the ‘E’ line of the Brubaker family, who spoke of his experiences with building and sailing a canal boat through the canals of the northeastern United States. He is a retired professor from Bluffton University in Bluffton, OH. He grew up outside of Lititz, PA, and is a grandson of Reverend Christian Musser Brubaker, former pastor of Strasburg Mennonite Church in Strasburg, PA. Don is married to Elaine Stoltzfus, formerly of Cherry Crest Farm in Ronks, PA, and they have two married sons and several grandchildren. Don has degrees from Hesston College, Goshen College and Wayne State University. He spent most of his career in social work education in Ohio. After retiring he has had no lack of activities to engage in as he has many hobbies and interests. Included among them are kayak building, sailing, traveling, and photography. Upon his retirement from Bluffton University in 2008, he collaborated with his friend and neighbor, Lynn Miller, a wooden boat enthusiast, to build and cruise a 30′ canal boat, known as the “Bi-Polar Express”. Lynn, with Don as his apprentice, spent two and a half years building their creation. Upon its completion, and for three consecutive summers, Lynn, Don, and their wives have cruised the Erie Canal across the State of New York, the Trent-Severn and Rideau Canals of Ontario, and the Monongahela and Ohio Rivers to Cincinnati. Each canal/river system offered its own character, history and points of interest. Don’s story featured highlights of his boat building and cruising on these amazing waterways. We also heard from cousin Lois Ann Mast who shared about the plans for an upcoming tour of the ancestral Brubaker homeland in Switzerland and Germany in 2018. Stay tuned for more information about this exciting adventure in the near future! 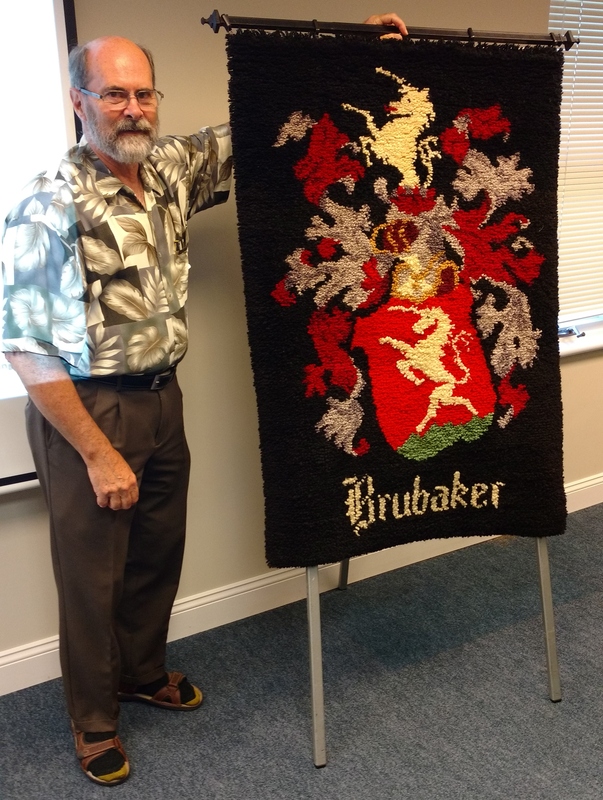 Family Association Business was momentarily conducted, including a short report by Treasurer Roger Brubaker, a status report by Sharon Brubaker Hines, our Chair and Event Coordinator for the upcoming celebration of 300 Years of Brubakers in North America. Be sure to mark your calendar for next year’s 300th Anniversary celebration!